Speaking My Mind: Another weekend another mix media? Another weekend another mix media? Or could that be medium? Tis our season, i.e. rainy/hurricane, arriving a bit early, nearly by two weeks... once again how would Mother Nature have an exact calendar, we don't, oh wait, I suppose we do; never mind. Any-who, the mix of today's weather was warm, humid and sunny in the beginning of the day, and later on moving into cooler and very wet/rainy stormy weather, and so that is how our outside weather is now at this time of year. But inside cool and dry, perfection. So I stay inside. 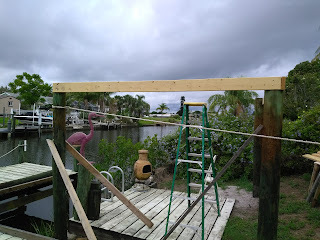 Hubby did feel the need to try to accomplish some more work today on the "tiki hut project", and so he did in spite of hazardous weather conditions later on in the day. He did work when it was just humid and hot. 100 square feet would be all that was needed, being that the hut will be ten by ten, but although logical I was wrong of course. Our choice was Mexican Palm Thatch 35"inches H, by 60' feet long, shown below, free delivery to the store. They, Home Depot, were actually cheaper than Walmart! 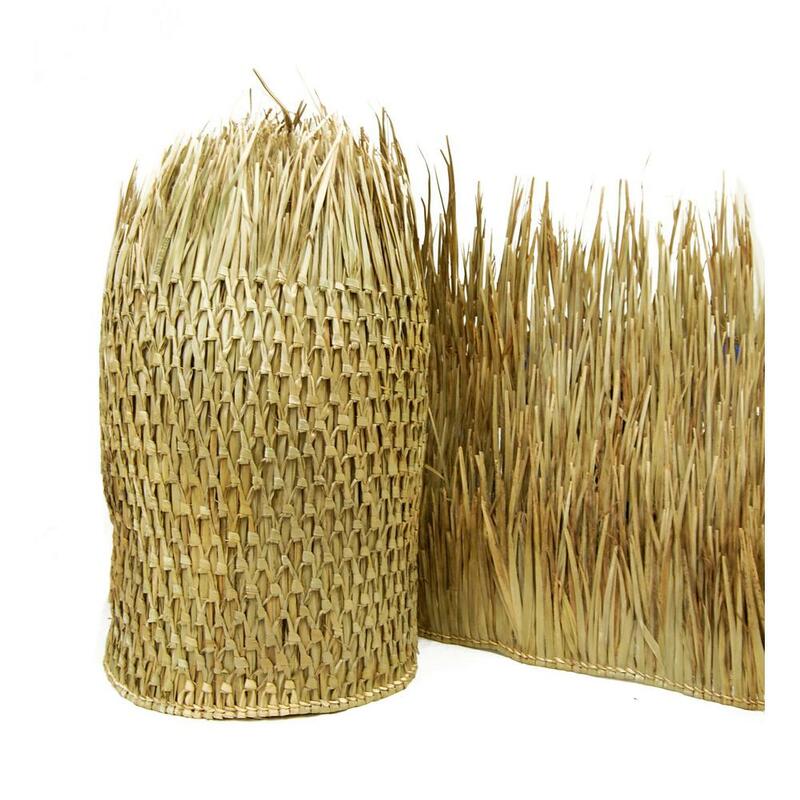 "Originally used by the natives in Mexico as shelter from the harsh climates, these "rain capes" now called thatch are used as decorative accent and roofing material. Woven together by palm leaves, Mexican thatch is an eco-friendly resource that can add a tropical touch to anyone's indoor decor or backyard space. Mostly used by contractors and commercial industries such as restaurants, resorts, and stores; thatching is easy to install and handle. See our full collection of Patio Parts to choose the best option for you." This is a concept picture for our roof line only! So this is where we are going. 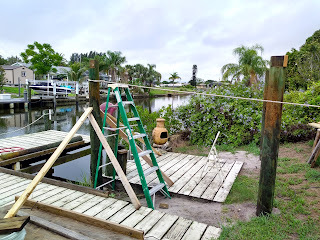 No tiki bar, since we do not drink anymore, anyway it is too long a haul to carry those items from the house, even with my outdoor wheeled patio cart, and we already have a table down there and chairs too, molded ones that are stacked in a corner of the yard. 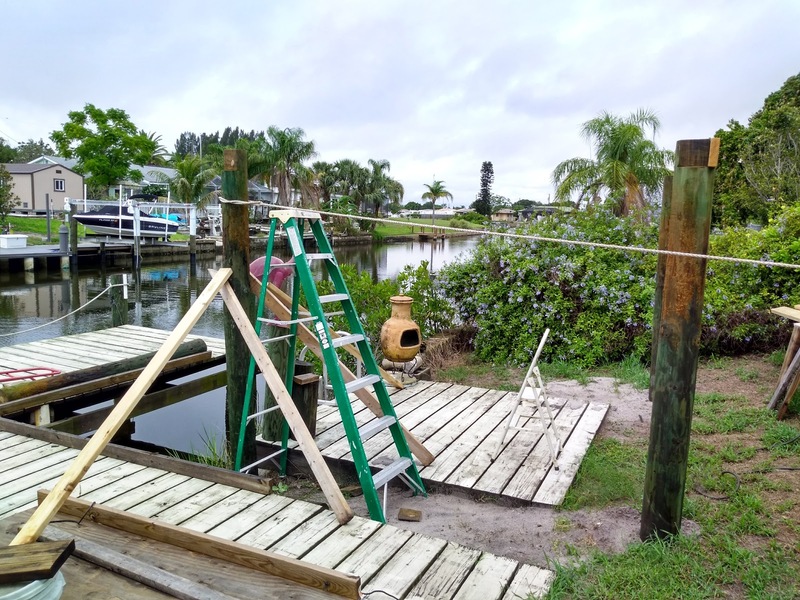 What I am thinking is some nice lighting, the large bulb hanging type and we are shaded so it will work day or night to enjoy the water views. Also a drop off sight from and to our boating travels, we will see what we will see...? 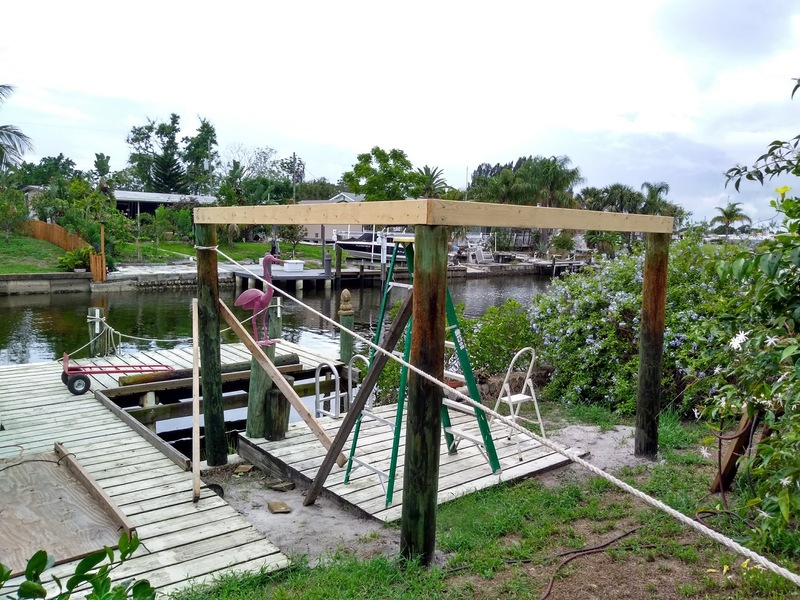 And hurricanes might/could have their way with it, and since it is not too expensive and will fall under our other home's insurances it can easily be replaced, well not easily, but replaced or not...no worries, be happy! Thus our hesitation since our nice Gazebo of way back when before August 13, 2004, Hurricane Charley that blew it away! Uh oh! No jinxing this project. Besides it is only a thing, and not a living thing at that matter! Make that a very happy good night all!